I am going to share a great EA today. Its Aggressor3 and works only in EURGBP. Time Frame M1. Min 250 USD reqd. Stop loss is considered in my .set file. You can change it as per your amount. You can try defaulf settings also. It works best with Exness - ECN account. so will these only work with that one broker ? i'm in oz, so bit choosy of brokers. In high risk - high gain strategies, it's very important to choose the right account type and keep enough balance in the trading account to sustain the trading process. When the portfolio and the strategy allow, withdrawal is always advised. Money management is not only about sizing the trades. It's also about securing funds by frequent withdrawals. If you've doubled your account already and you're still trading with your own money, greed has already taken control. This EA can double an $1000 account in about a month. The second month we can "play with house money". This strategy stacks a number of trades and closes them grouped on each side. 6 trades are usually enough if the distance between them is correctly planned. The test was done on the only instrument and timeframe the EA works by design: EURGBP M1. The account is a Standard FBS account leveraged 1:500 with $1000 initial balance. The high leverage is not there to put huge trades in. The high leverage account is used to allow big trades to cost less if needed. When the EA needs to place 6 trades and the basket is about 0.5 lots overall, that only costs $100 with this leverage. The rest is free for floating P/L. On lower leverage accounts, one would need proportionally more balance to keep the same trades open if nothing else changes. Add to that the drawdown in money you're expecting and you've got your minimum balance requirement for the strategy NOT to blow the account. It won't hurt to have more in the account, but in any case, do not trade with less. High leverage does not kill accounts - The size of the trades does that. So, keep trading as small as you can, even on high leveraged accounts. lotsize=0.05, gain monthly about $1900. 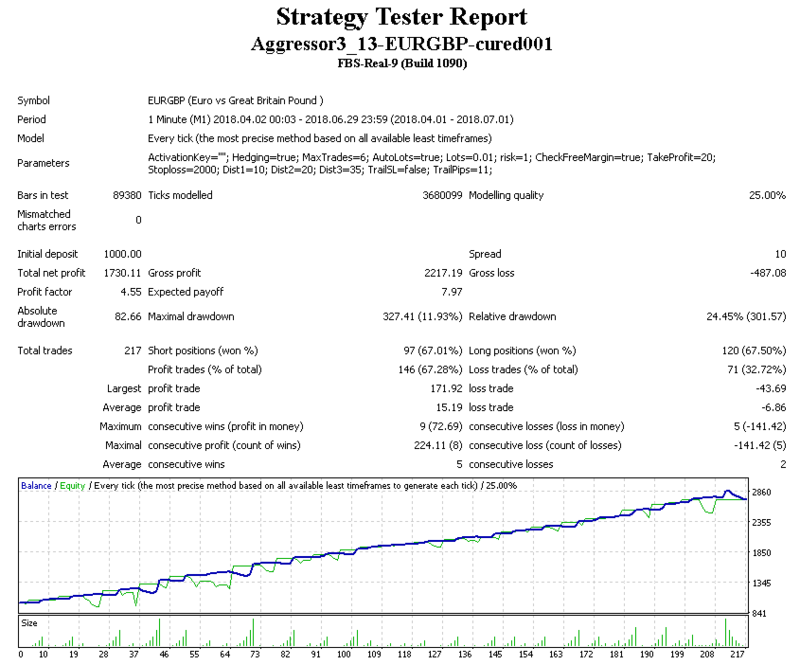 I have try the aggressor EURGBP and the default setting was good. I've been back testing it for a week and everyday is a profit. if use default to backtest for 2017 to 2018, it does not pass. I wanted to open the file and it tells me impossible to open the file it says corrupted file, I use Winar to open the files, can we help please?